Charter Automotive is a world class Tier 1 and 2 supplier of engineered components for the automotive industry. We are headquartered in Milwaukee, Wisconsin with manufacturing, commercial, technical, and distribution facilities located around the world to support Original Equipment Manufacturers' global requirements. We are a market leader in the production of valve spring retainers, valve keys, valve spring seats, synchromesh sliding keys, caps and wear pads. In addition, we offer several value added options including kitted valve keys and valve spring retainers. 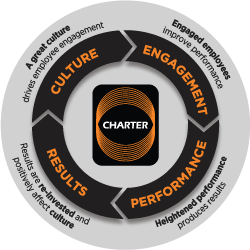 Charter Automotive is a member of the privately held Charter Manufacturing family of companies, with whom we are vertically integrated to provide best-in-class support, service and turn-around times for our customers. The foundation of Charter's family is a basic set of core values. These values have shaped the company over four generations and are fundamental to who we are as a company and as individuals. Trust. We earn trust by having integrity, being accountable, communicating openly and developing our relationships and capabilities. Teamwork. We work best when we are collaborating with each other. Safety. We want everyone to finish their work in the same condition they started. Continuous Improvement. We strive to get better every day. A leading American supplier of carbon and alloy steel rod and wire products and the largest steel coil processor in North America. As a fully integrated steelmaker with locations in Ohio and Wisconsin, Charter Steel offers a full range of grade and size coiled products and vast technical service experience. Focused on continuous cast iron bar products and comprised of two business units. Dura-Bar is the world’s largest producer of continuous cast iron bar products with headquarters in Illinois and a distribution center in China. Dura-Bar Metal Services is Dura-Bar's largest distributor, serving over 3,000 global customers, from locations in Illinois, Pennsylvania, and North Carolina. A vertically integrated global leader in cold rolled and shaped wire. Charter Wire is a major U.S. supplier of the highest quality precision cold-finished bar, cold-rolled steel and custom profiles, and flat wire and standard shapes to a Blue Chip customer base. Supporting our communities is a fundamental part of the Charter Manufacturing family. By paying it forward to the communities that embrace our companies, we create a positive chain reaction of benefits for everyone including our employees and their families and members of our communities, local businesses and our customers. In addition, we help create opportunities and encourage our employees to volunteer. And together, we improve the quality of life in our communities.